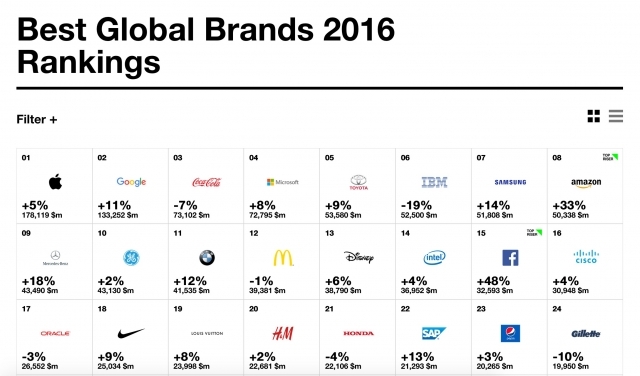 Interbrand has ranked Apple as the world's most valuable brand for the fourth consecutive year. The company identified the 100 most valuable global brands by analyzing the many ways a brand benefits an organization—from delivering on customer expectations to driving economic value. 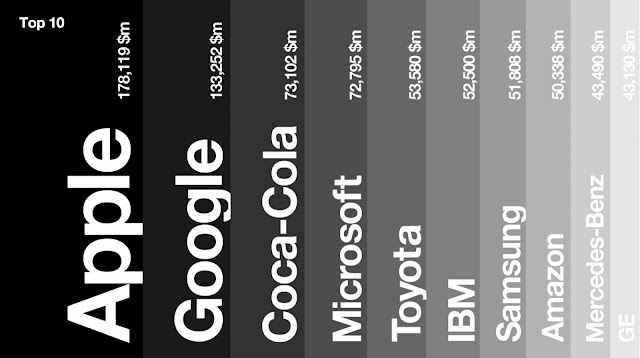 Top 10 Brands: Apple, Google, Microsoft, Samsung. It also features some of the Top Growing Brands, with Facebook (+48%) as the Top Growing Brand in 2016, followed by Adobe (21%), Huawei (18%), Samsung (14%) and SAP (+13%), and number 2 ranked Google at (+11%). Tech companies are looking without to grow within. Apple shows how ecosystems drive value. Analysts have often pointed out that “Apple has superior products.” While true, this opinion undersells the brilliance of Apple’s functionally- integrated model. Its software, hardware, and touchpoints are connected not just by beautiful design aesthetics, but by a level of interoperability that justifies the Apple premium and discourages defections to another platform. And the more data you share, the more personal it becomes— adding new devices is painless and the thought of switching increasingly unpromising. Apple is the Alpha of Cohesiveness in full effect.